Phone accessory giant Jabra today unveiled its new Jabra Sport Pulse Wireless Earbuds, a pair of fitness-minded Bluetooth headphones with an integrated heart monitor. The $199 Jabra Sport Pulse is definitely a premium offering. The earbuds boast immersive Dolby sound with wind noise reduction, while the included mic lets you take and make calls while on the run. You can also control the volume, pause music and skip tracks using the inline remote so you won't need to fiddle with your phone all the time. There are great sports features too. These earbuds feature an in-ear heart rate monitor that interfaces directly with the included Jabra Sport Life app, keeping you “in the zone.” And, of course, these fitness-focused headphones are sweat- and water-resistant. The only catch here is that pulse monitoring takes a pretty big bite out of battery life. The Jabra Sport Pulse only gets 5 hours of talk and music play time on a charge. That’s slightly better than the 4 hours you get from the LG Heart Rate Earphones, but pales in comparison to the 12+ hours of playtime I get out of a charge of my non-pulse monitoring Sol Republic Tracks Air. If charging yet another device is a major pain point, you might be better off with a less-expensive pair of wired pulse monitoring headphones like the SMS BioSports. 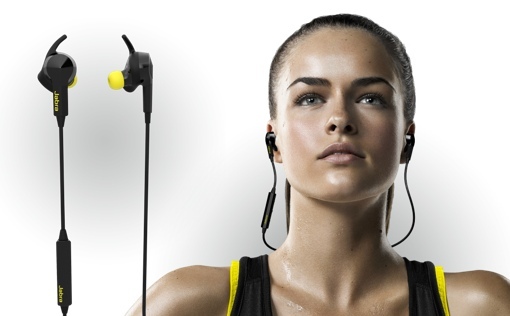 The Jabra Sport Pulse headphones are expected to begin shipping October 1. You can pre-order a pair for $199.99, shipping included, at Jabra.com.